Did you know that saliva is one of your body’s defenses against viruses and bacteria? Keeping your mouth healthy helps keep your whole body healthy. Brushing, flossing, staying hydrated, and visiting your pediatric dentist in Golden Valley, MN twice a year helps your saliva do its germ fighting job! In addition to keeping your mouth healthy, here are some little things with big impact to keep the bugs at bay. Good hygiene habits like washing your hands often can help stop germs from spreading. If soap and water aren’t available, use an alcohol-based hand sanitizer. 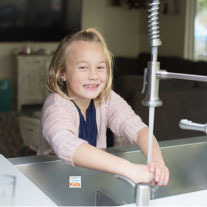 Washing your hands regularly reduces the chance of spreading respiratory and tummy bugs, so get your kids in the habit when they leave school, after play-dates, and before meals. The amount of time you wash your hands is also very important! 15-20 seconds of hand washing is recommended, so teach your children to sing Happy Birthday to themselves twice before they finish scrubbing. If you are feeling sick, stay home! Keep Golden Valley healthy by limiting interaction whenever necessary until you feel better. If you have a child who’s ill, cleaning up with germicidal wipes containing bleach, can prevent spread of nasty viruses among you and your children. Covering your mouth and nose with a tissue or your elbow when coughing and sneezing is also a great habit to teach little ones. Ask their teacher and day care providers if they have enough kleenex and hand sanitizer for their classroom. We know that all of the teachers of Golden Valley’s Schools will appreciate it! Germs enter our bodies through our eyes, nose, and mouth so keep hands from touching faces (including their own) as much as possible. Get everyone at home on board with cleaning their doorknobs and room surfaces. Keeping sanitizing wipes or a spray bottle filled with kid-safe cleaning spray in plain sight around the house is a great reminder to keep things clean and healthy. Harley A. Rotbart, M.D., says that, ‘”Exercise is better than any advertised cure or miracle.” His studies show that regular, moderate exercise can reduce the number of cold and flu episodes that occur over the course of a year by 25-50 percent, possibly by boosting the circulation of infection-fighting cells. Make sure everyone is getting physical activity (spend some time at Brookview Park! ), their recommended hours of sleep, is drinking enough water, and eating nutritious food. Meals with plenty of colorful fruits and vegetables will help boost your child’s immune system. Look for foods rich in vitamin C (broccoli, strawberries, and oranges) and vitamin D (tuna, fortified milk, and cereals). Our orthodontist, Dr. Miller, eats handfuls of spinach every day, and has not had a cold in over 3 years. Ask him, he’ll tell you all about it!! Eating yogurt with active cultures (probiotics) can also help build defenses. All of the healthy kid recipes we’ve shared in the past year are a great place to start! See them all @goldenvalleykids on Facebook or Instagram. Dr. Adena Borodkin and the rest of the Golden Valley Kids Team wish you a very healthy and happy 2019!